Pretty much binge-read entire series for Can You Read a Series in a Month? Challenge. But considering that it was only four books of less than 400 pages each plus one novella, it wasn't much since I average more books than that monthly. 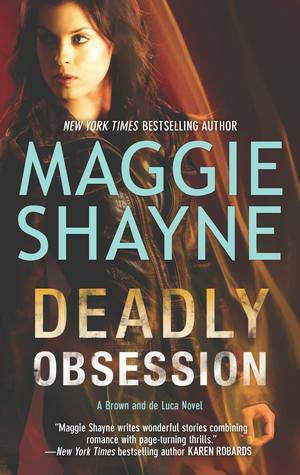 But this series was pretty awesome, so I'm not complaining or anything... except that I am because author Maggie Shayne has stated that there will be a new installment of the Brown and de Luca series that is supposed to be out this year, but I've seen no peep of any such thing yet. Anyway, this series was awesome (as I already said). I don't know if I liked this fourth book more than the third book, but the romantic chemistry between Rachel and Mason was definitely MUCH better than the previous. The plot was less of a mystery and more of a suspense and crime thriller since the culprit is revealed at the beginning anyway, but there was plenty excitement had by all. And Rachel's snark as well as Myrtle's awesome dogginess is definitely a bonus! Proper full review to come! And the rest of the reviews for the other books in this series will be posted soon, too!